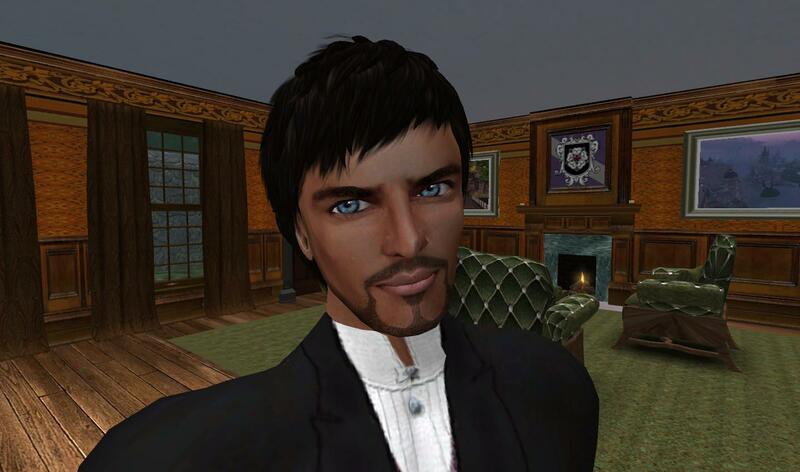 Ambassador’s Chapel was established in Winterfell Ebonshire in April of this year by Addison Greymyst, the New Toulouse Ambassador to Winterfell and Danko Whitfield, the Winterfell Ambassador. A place of peace and goodwill, it is non-denominational. You are invited to visit. Here is the story of how this church came to be. Some months back – as noted previously in these pages – two churches were established in southern Winterfell. One was located in the Port Laudanum neighborhood. It was a medieval building and I found it quite interesting to look at in my walks about town. I meant to go in one day and sit in the quiet, to meditate and pray. But as with so many things on my “to do” list, I never found the time to get to it. One day as I walked along the channel I saw that the church was gone. I was quite disappointed that I had not been inside. But soon thereafter on another walk, I was surprised to discover that the church was back in its old spot. Could this be a miracle? I decided to go inside at that very moment as I was not going to make the same mistake twice. Once inside I looked about, lit a candle, took a seat, kneeled to pray. Then I stood at the back of the church for sometime, just taking it in. The image, the atmosphere. 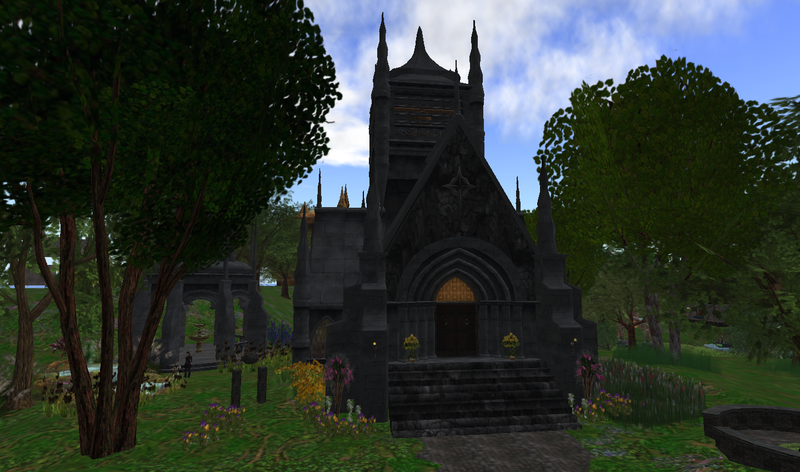 I snooped around a bit and discovered that the church had a new owner, my friend Addison Greymyst. Another day, another walk around town. What’s this? The church is gone again! I later found out that Mr. Greymyst had reorganized his holdings and the church had to be removed. I told him how much I liked it and he said he regretted having to remove it but hoped to bring it back some day. One day I was chatting with Mr. Greymyst in The Emerald Inn. We were discussing our properties and sharing our plans when he mentioned again that he missed the church and I replied that I did too.. I happened to mention that a very nice piece of land on the river near my cottage in Ebonshire was for sale. The idea struck us both right away – let’s buy it together and put the church there. It would be just perfect in that spot! So we did. It did look perfect for northern Winterfell in general and that spot in particular. We made plans for the project – how to landscape the rest of the property, how to organize a group to manage the church. The ideas came quickly but there was one basic question that proved difficult to answer, what shall we call our church? After much discussion we came up with Ambassador’s Chapel. We were quite pleased with the name and made it the official name of the church, the parcel and our group. It was only then, that a question arose…Shouldn’t it be Ambassadors’ Chapel rather than Ambassador’s Chapel? What would the literati say? How would we explain this? I suggested we incorporate this into the basic tenets of the church and Mr. Greymyst agreed and left it to me to tackle this question. There are many religious concepts that defy scientific or logical explanation. Such concepts rely purely on faith. Ambassador’s Chapel is owned by Addison Greymyst. Therefore it is his church. Rather than call it Ambassador Greymyst’s Chapel, it is known simply as Ambassador’s Chapel. Ambassador’s Chapel is also owned by Danko Whitfield. Therefore it is his church. Rather than call it Ambassador Whitfield’s Chapel, it is known simply as Ambassador’s Chapel. The church, the land, the management group are all owned by Ambassador Greymyst. They are all owned by Ambassador Whitfield as well. They are owned by each Ambassador individually. As Mr. Whitfield has stated: “He” owns it, “I” own it, but “We” do not own it. Hence, The Mystery of The Holy Apostrophe.